Parents generally and reasonably assume that their infants are not at risk of injury when placed in their cribs for the night, and that constant vigilance is not required in order to keep them from harm. 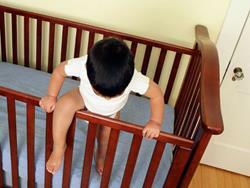 If a crib is defective in manufacture or design, however, it can lead to a child injury or death. If your child has sustained a crib-related injury, you may be entitled to recover damages from the party or parties responsible. Crib-injury lawyerJeffrey Killino is dedicated to helping children and families obtain the compensation they deserve. Contact Jeffrey Killino at 877-875-2927 to learn about your legal options. Crib slats may have no more than a 2 3/8″ distance between them. The crib may not have loose or missing slats. The crib may not have a decorative corner that extends 1/16″ or more above the post itself. The crib may not have a lead-paint coat. The crib may not have an odd or sharp cut-out in its headboard that could potentially snag a child’s limbs or clothing. The American Academy of Pediatrics (AAP) warns parents to ensure that any crib they purchase for their infant adheres to the most up-to-date federal standards. If children are cared for and sleep in a crib in another’s home or in a daycare facility, parents need to make the same diligent inquiries about the cribs on those premises, as well. Depending on the circumstances of a crib-related injury, a number of parties may be held liable under more than one legal theory. Cribs are often recalled for defects that are known to cause or pose threats of injuries to the infants who use them. In 2011, the CPSC estimated that over 11 million cribs and similar products had been recalled since 2007 and recommends that parents make a habit of regularly checking for crib recalls at the CPSC’s online Crib Information Center at www.cpsc.gov/info/cribs. Even when a crib is not recalled, however, but a defect in the crib is a cause of a child’s injuries, the manufacturer and anyone who distributed or sold the crib or any of its defective component parts may still be liable for injuries sustained by a child as a result of the defect. If a crib’s defect is a cause of your child’s injuries, a product-liability action allows a plaintiff to recover damages from the manufacturer or anyone in the chain of the crib’s distribution if the plaintiff can prove, by a preponderance of the evidence, that the crib was defective and that the defect was a cause of the child’s injuries or death. Generally, if a plaintiff can show that the crib was being used in the manner intended when a child personal injury occurred, and that a design or manufacturing defect was a cause of the injury, the plaintiff will prevail in a strict liability suit. Defendants may also be found liable under a strict liability if the injuries sustained by a child were caused by the manufacturer’s failure to warn of dangers associated with its use. Crib defects have been known to cause children to suffer suffocation or strangulation injuries that lead to the infant’s death. If a child dies as a result of a defective-crib injury, the child’s parents may bring a wrongful death action against the party or parties responsible. A wrongful death action is brought by a decedent’s survivors on behalf of the survivor. The damages recoverable, therefore, are the same damages a child would have been able to recover if he or she survived. When an infant survives a crib-related injury, the effects are sometimes permanent and catastrophic, including brain damage from asphyxiation, reduced learning ability, and even cerebral palsy. Recovery may be allowed in such cases for past and future medical costs, pain and suffering, rehabilitation, physical and other therapy, loss of earning potential, and more. If your child has been injured or killed in a defective-crib accident, call experienced crib-injury attorney Jeffrey Killino at 877-875-2927 to obtain the justice you and your child deserve.